This view of layered rocks on the floor of McLaughlin Crater shows sedimentary rocks that contain spectroscopic evidence for minerals formed through interaction with water. The High Resolution Imaging Science Experiment (HiRISE) camera on NASA’s Mars Reconnaissance Orbiter recorded the image. New data from NASA’s Mars Reconnaissance Orbiter suggests that the McLaughlin Crater once held a lake fed by groundwater. Pasadena, California — A NASA spacecraft is providing new evidence of a wet underground environment on Mars that adds to an increasingly complex picture of the Red Planet’s early evolution. 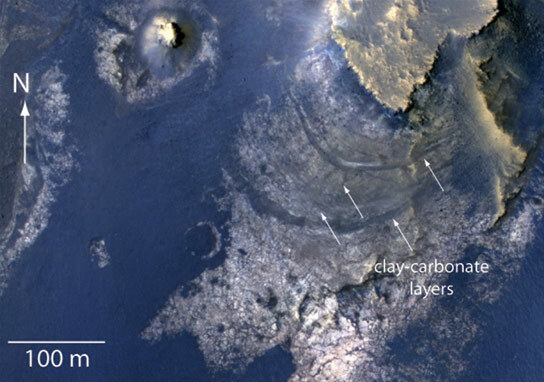 To see an image of the carbonate-bearing layers in McLaughlin Crater, visit: http://photojournal.jpl.nasa.gov/catalog/PIA16710. Be the first to comment on "Mars Orbiter Shows McLaughlin Crater May Have Once Held a Groundwater-Fed Lake"